First on “Obama Claus’s” list was a group of patients 4 years and up who were making snowflakes in one of the hospital’s playrooms. After the excitement died down, the former President handed out jigsaw puzzles (which were his grandmother’s favorite, he told the crowd), Hot Wheels sets, remote-control cars, and glittery nail polish, among other goodies collected by “Obama Claus” and his staffers. 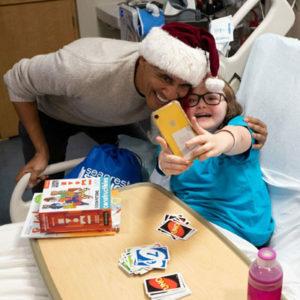 Before leaving, “Obama Claus” thanked the staff for working during the holidays and recorded a video message to be played on the hospital’s internal TV system for those he wasn’t able to visit during the trip. At the end of his 90 minute visit the doctors, residents and nurses cheered for “Obama Claus” before bursting into an impromptu rendition of “We Wish You a Merry Christmas.” Think our current “Grinch in Chief” might learn from example?